The previous article looked at how Eakins showed little pictorial interest in the city, and how Chase found ingenious ways to bring the countryside into the city, and to draw attention away from the urban. Henri studied in Paris, mainly in conservative Salon style, but was also strongly influenced by Millet and Impressionism. He returned to paint and teach in Philadelphia, revisiting Paris quite frequently, and from 1902 taught in New York City. 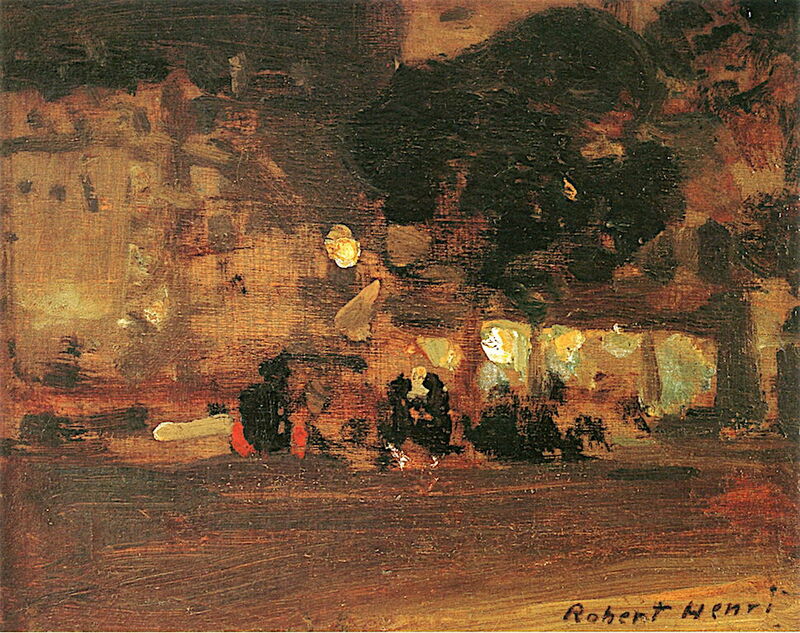 Robert Henri (1865-1929), Nocturne Café (c 1900), oil on board, 11.4 x 13.3 cm, Private collection. The Athenaeum. His Nocturne Café (c 1900) could have been painted on either side of the Atlantic, but confirmed his fascination for real urban scenes. Robert Henri (1865-1929), Cumulus Clouds, East River (1901-02), oil on canvas, 65.4 x 81.3 cm, Smithsonian American Art Museum, Washington, DC. The Athenaeum. In his Cumulus Clouds, East River (1901-02), the buildings frame the clouds in repoussoir, just as was commonly done with trees in rural landscapes. Robert Henri (1865–1929), Snow in New York (1902), oil on canvas, 81.3 x 65.5 cm, The National Gallery of Art, Washington, DC. Wikimedia Commons. 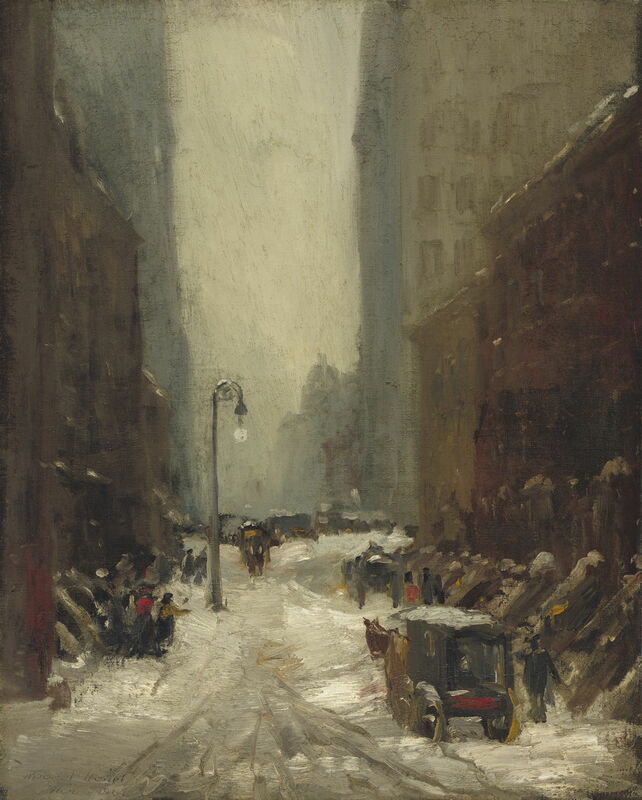 Then on 5 March 1902, he painted Snow in New York (1902), a true cityscape devoid of trees or green, its streets properly populated. At about the same time, he painted Street Scene with Snow (c 1902). 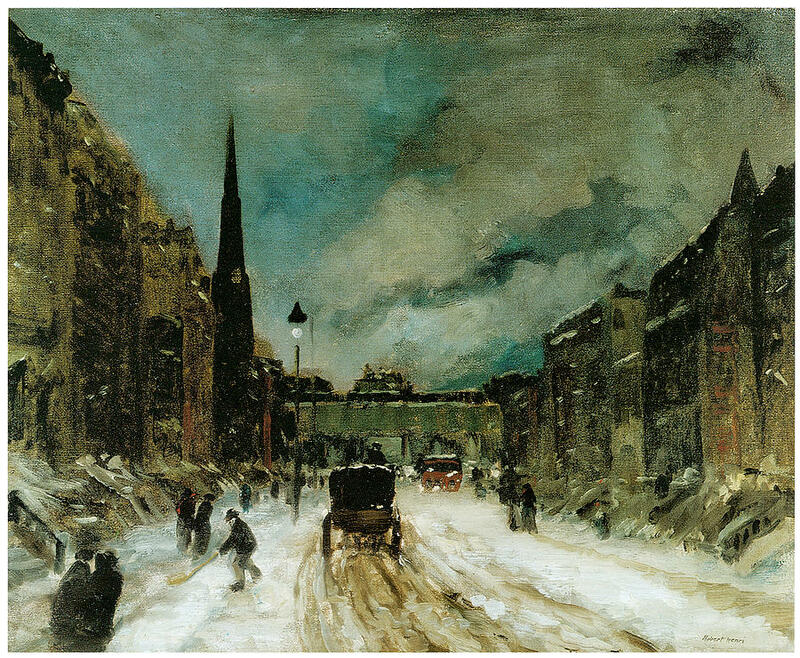 Robert Henri (1865–1929), Street Scene with Snow (c 1902), further details not known. Wikimedia Commons. Robert Henri (1865-1929), Morning Reflections (1910), oil on canvas, 96.5 x 71.1 cm, Private collection. The Athenaeum. His later Morning Reflections (1910) is dominated by its buildings, and thoroughly urban. 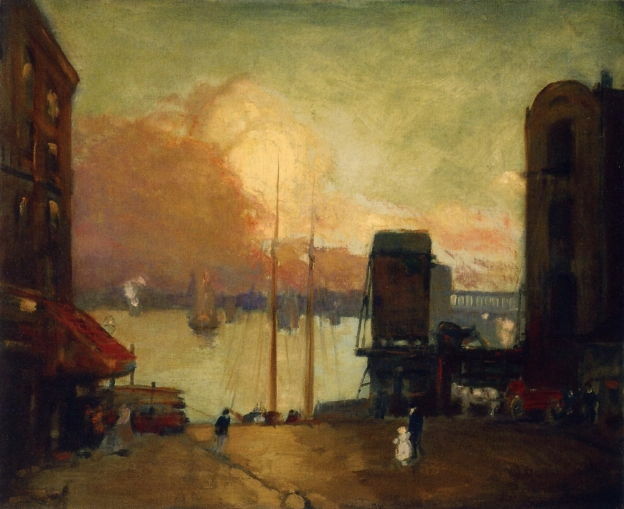 As one of the founders of the Ashcan School, Henri showed how successful the cityscape could be, but does not appear to have developed the sub-genre any further. Cooper initially trained with Eakins in Philadelphia, then studied in Paris. 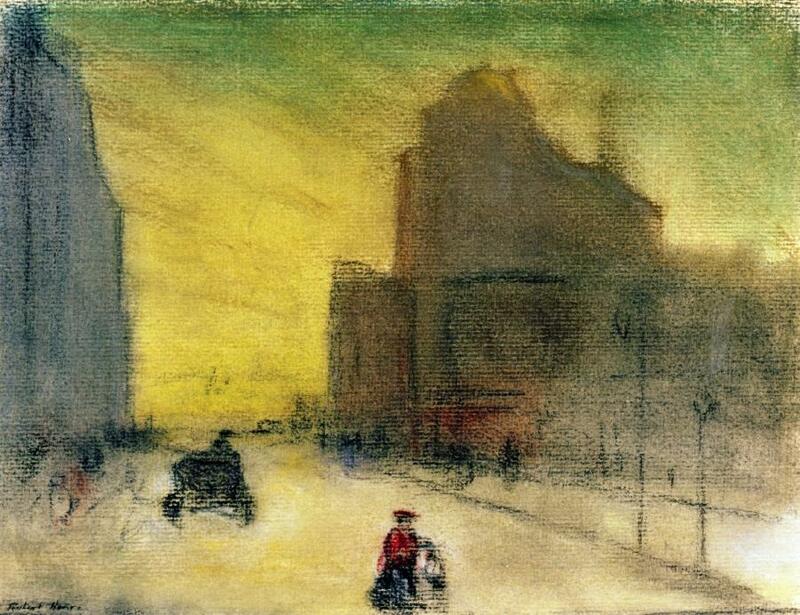 He moved to New York City in 1904, by which time he had already started to paint urban landscapes. Once he was among the growing skyscrapers of New York City, they became something of an obsession, together with the crowded streets below. He was probably the first American specialist in cityscapes. 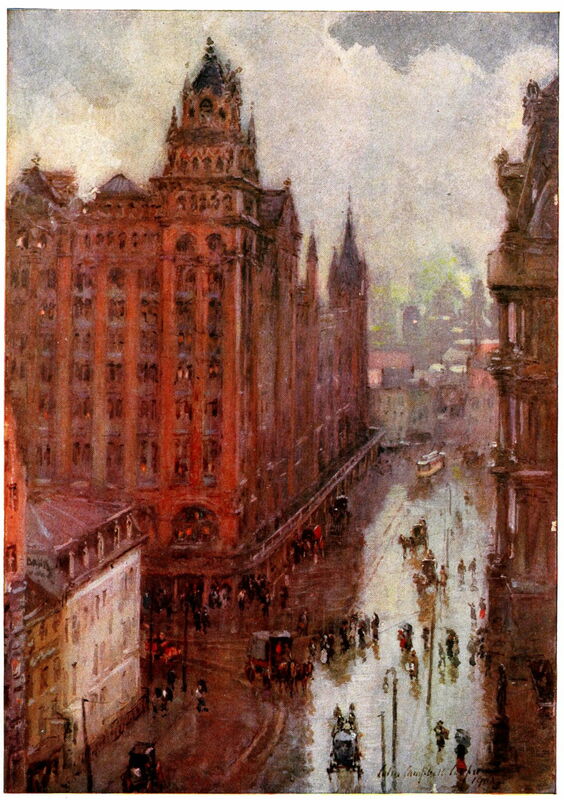 His Broad Street Station, Philadelphia, in the Rain (c 1905) records both the rising buildings and the people below. Cooper’s cityscapes are some of the most distinctively American paintings of this period. His focus, though, was on the enormity of the buildings; the people seldom seem to have been of much significance, either in their size or in their lives and social issues. Bellows trained with Robert Henri in New York, and worked from his own studio in New York City for much of his career. 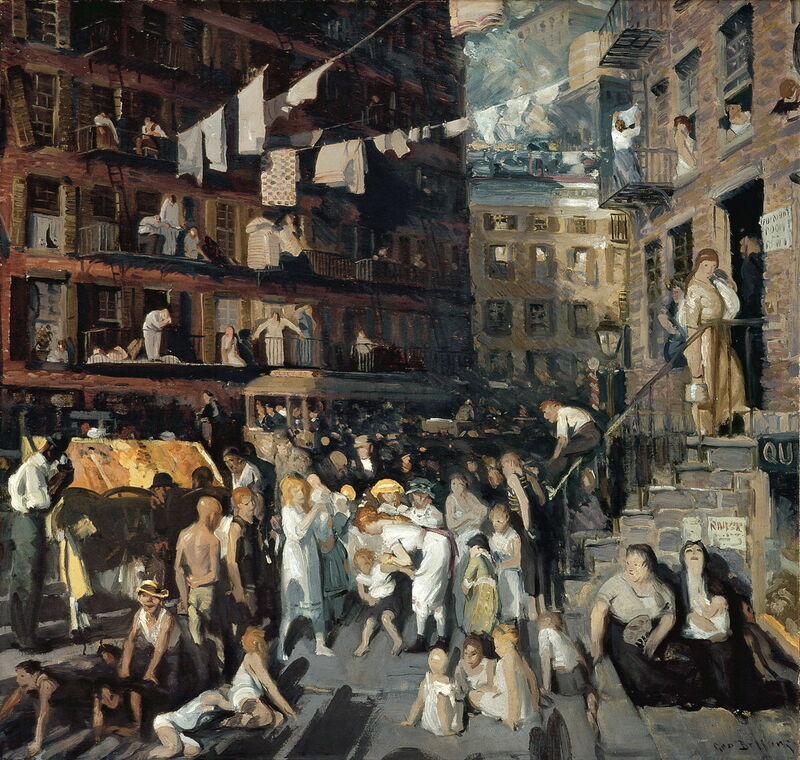 As Cooper was busy painting skyscrapers, Bellows concentrated on the lives of working class migrants living in the tenements of Lower East Side. 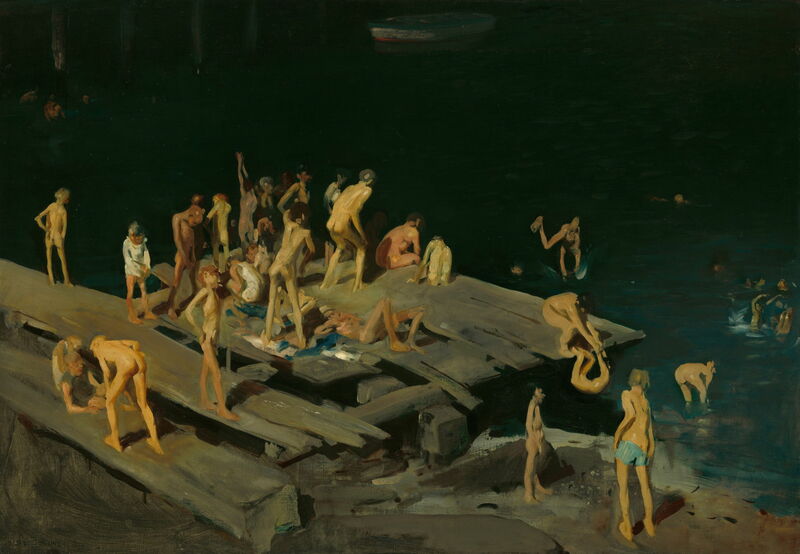 In Forty-two Kids (1907), he showed the unruly youths at play by the water, in apparent homage to Eakins’ Swimming (1885), restaged in this urban setting. He showed the deep excavations required for the contruction of the city’s skyscrapers. Most memorable of all, though, he showed the people who lived in the city. 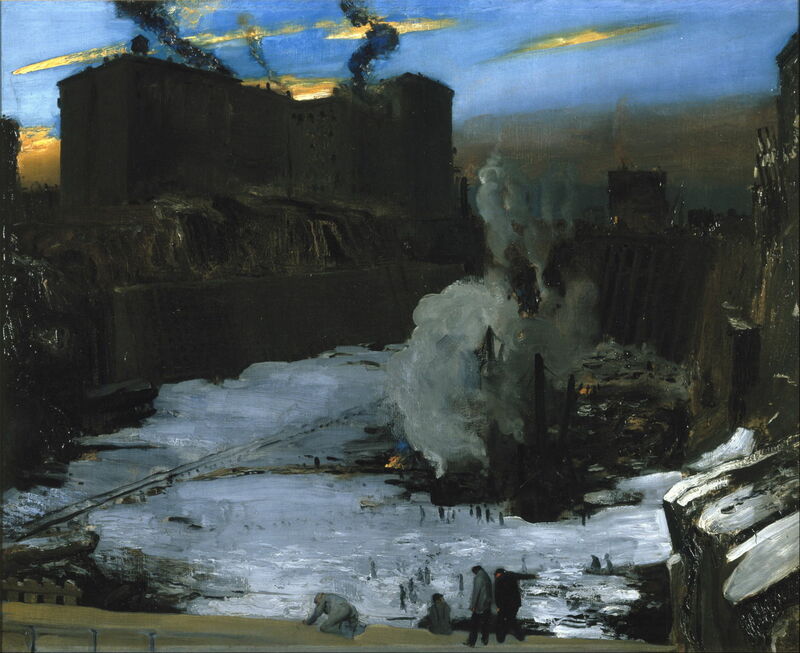 It was surely George Bellows who finally brought cityscapes to become human landscapes. In just over thirty years, and five great artists, the focus of attention had been drawn from the countryside to the lives of those in the cities. Posted in General, Painting and tagged Bellows, cityscape, Cooper, Eakins, Henri, landscape, painting. Bookmark the permalink.